And saying that, I left Italy and went to Texas. No wait, not Texas, I meant Japan. It took a good 24 hours to get to the house country of the rising sun, with stops in Frankfurt and Osaka. 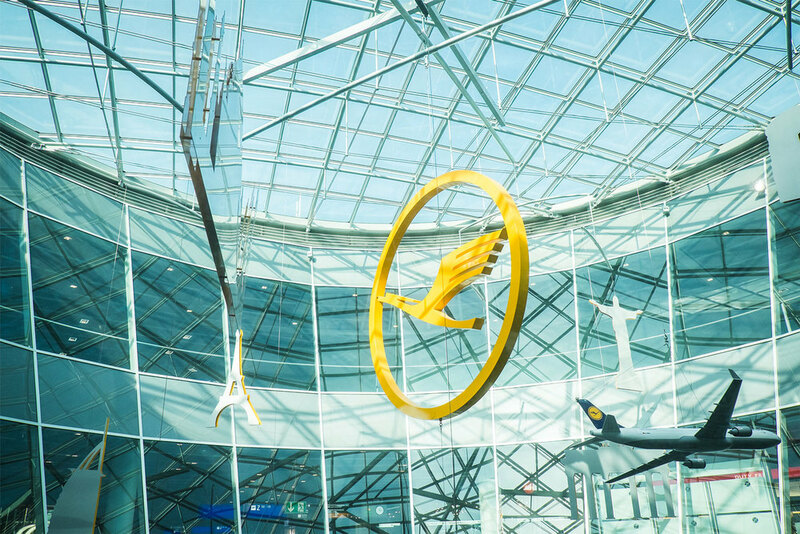 Speaking of which, have you ever been to Frankfurt Airport? That place is freaking gorgeous! I would sign a petition to change its name to “place with the most awesome light ever” in no time, no questions asked! After running like crazy from one side of the airport of Osaka to the other, ‘cause of stupid japanese rules on luggage, and a few more hours of flight, I finally landed in Naha, Okinawa. Do you see that light! C'mon, it's so beautiful it hurts!!! At the airport I had the best welcome ever: along with Sio there were Robert, a half Irish half Italian american ex military, his lovely daughter Adriana and Moses, whom we would soon discover to be the one real King of Dogs. Adriana taking a good look at me. 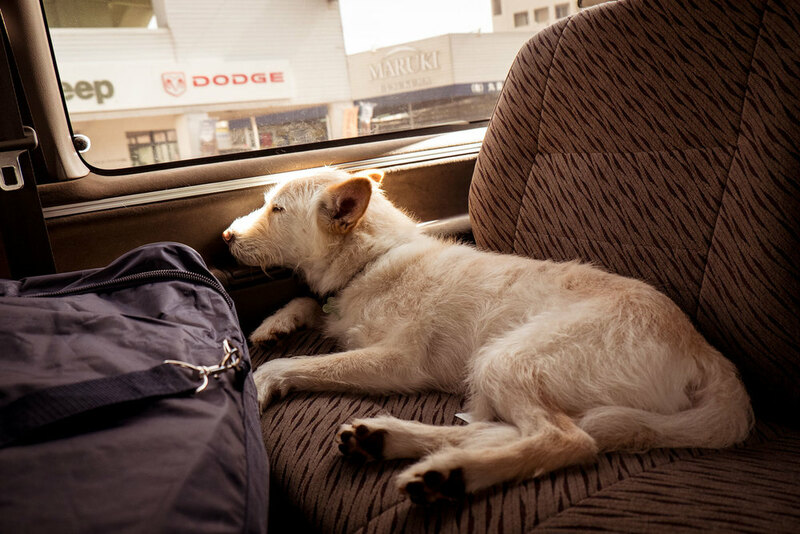 Moses takes a nap in the bckseat. This loud display of excitement took a good 5 minutes after which we headed straight to our first hosts, Fabian and Lindsy. Ok, let me spend a few words on those guys : they are so cool it’s unreal! They have a nice, very american house in in Yomitan and rent two bedrooms on AirBnb. We couldn’t have, even remotely, hoped for better hosts as Fabian and Lindly (and their dogs Moses and Chopsticks) truly know how to open up their house to you and make you feel at home! Fabian and Lindsy in their living room. After spending the first night trying to figure out the itinerary and the calendar of our trip, we basically dropped dead in bed just to be awoken, the morning after, by the door bell. It was the postman, with our bikes. We felt like kids on christmas, in overdose of happiness and excitement. The bike were sent to Japan by our main technical sponsor, Specialized, pre-assembled and fitted with our custom settings. A few days earlier and almost at the same time regardless of the geographical distance, me and Sio both were invited by Specialized to undergo their Body Geometry Fit process, usually done exclusively for profession athletes, that consists in a session with a Specialized technician that helps you understand your biking needs and sets the bike to perfectly fit your body, your biking style and your characteristics, in order to avoid any postural problem and allow for the highest efficiency with the minimum pain. After assembling the bikes and setting up our Tubus Racks and our Brooks Bags, we still were far away from being ready: we were still missing tiny (ehm) details such as bike monitors, clip less bicycle pedals, head and tail lights ecc ecc. So we hopped on our brand new bikes and went for a little tour of ALL the bicycle shops in the surrounding area to find the missing pieces. A good 30km after, we were finally all set. A good dinner and a great night of sleep was all we had left to do, and so, the morning after at 7am sharp, we left Yomitan and headed to Motobu, one of the northern cities of Okinawa, our sailing point to Kagoshima. It was a pretty sweet ride, but for the first 40km all we encountered were long shores and wind. A LOT of wind, always right in our faces. (who would have ever thought that coastlines are windy, huh? Duh!) Landscape-wise, Okinawa is kind of weird: in urban areas you can really feel the presence of the United States and their military bases, but once you go outside of cities and in more rural areas, you get surrounded by this wild natura, overflowing, that made me a little feel like I was in a Jurassic Park movie. Hollywood, where the statue of liberty is. In Okinawa, of course. Weather-wise, we didn’t have the best possible conditions as it was always clouded, foggy and a little rainy too. After a good Goya based lunch break (Goya is a fruit/vegetable typical of Okinawa) we decided we were a little sick of all the wind and tried to take the shortcut away from the coast. Worst. Decision. Ever. Goya gives Sio a ton of energy to draw comics. We completely succeeded in our goal of avoiding wind, but we encountered my nemesis : biking uphill. 10 km that seemed never to be over to me. Around 6pm we reached Motobu, our destination for the day and, after devouring pretty much everything they had in a local restaurant, we set up the tent and again, dropped dead to sleep. 70km, not bad for a first day. The ferry was very happy to see us reach Motobu in time. This morning, we woke up to the sound of an old toothless japanese guy outside our tent, packed up, took the bikes on board the ferry and set sail to Kagoshima, where we’ll land tomorrow. After that, 100 more kilometers and we’ll be in Cape Sata, officially the southernmost point of Japan, true starting point of our adventure!